East Midlands bakery Luke Evans has invested £75,000 in new equipment which will allow it to produce up to 9,000 bread rolls per hour. L-R: Luke Evans Bakery managing director David Yates, Amber Valley MP Nigel Mills and Luke Evans Bakery operations director Helen Yates. The new machine gives the Derbyshire family run bakery an extra 50% capacity for roll making and has been purchased in response to increased demand. 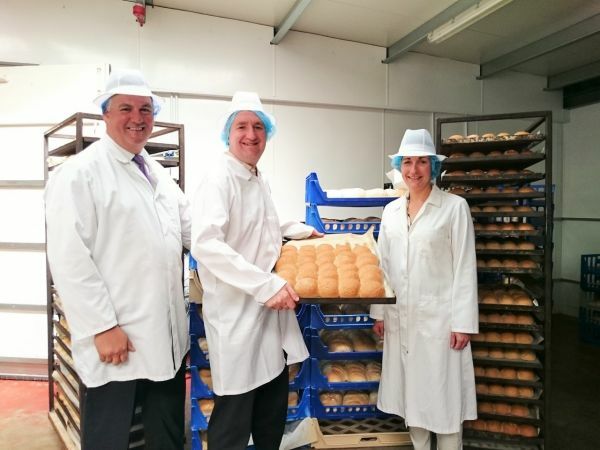 Amber Valley MP Nigel Mills recently toured the bakery at Riddings, near Alfreton, to find out more about one of the oldest family run bakeries in the country and to meet some of the 50-strong workforce at Luke Evans, which was founded more than 200 years ago. “We gave him a full tour of the bakery, where he was able to talk to the bakers, and see what was involved. We were busy with the bread production, and he watched and asked questions about the various different processes and types of breads the bakers were making. “It gave us the chance to highlight our latest investment – an Oddy Novatek roll plant which has replaced the Original Oddy we first purchased 22 years ago. The machines, manufactured just outside Leeds, are known in the industry for their incredible strength and durability, and even though it’s 22 years old, I have had numerous customers trying to buy my retired machine. “The new equipment is very similar in its design to the original one, but has been upgraded from a two-pocket to a three-pocket machine. This gives us the capacity to produce up to 9,000 bread rolls per hour. The other big advantage is that this new machine will mould all sizes of finger rolls which gives us greater consistency and is less labour intensive. Previously we hand rolled all of our finger rolls. Luke Evans sells direct to the public from its shop in Greenhill Lane, Riddings, as well as supplying around 300 trade and wholesale customers across Derbyshire, Nottinghamshire and Staffordshire, including shops, cafés, schools, and delis. Fully trained craft bakers operate 24 hours a day turning out breads, cakes and savoury products from farmhouse loaves and bread rolls to fresh cream éclairs and iced buns. The company, founded in 1804 by Henry Evans who named it after his brother Luke, has also recently appointed a new management structure. A forward-thinking business, while still being loyal to its 200-year-old heritage, the team is passionate about supporting the future of the craft-baking industry. Luke Evans Bakery operations director Helen Yates has been involved, along with other craft and plant bakeries across the country, in developing Trailblazer Apprenticeships for the bakery industry alongside the National Skills Academy for Food & Drink. During the course of the visit, David and Helen Yates discussed with him their views on supporting local and small businesses, and how they encourage customers and stockists alike to support local producers. “We were very pleased to host a visit from our MP Nigel Mills, as it gave us the chance to demonstrate what goes on at one of the region’s oldest family run craft bakeries in the East Midlands at a time when Luke Evans is continuing to invest and develop,” added David Yates.